I got the pattern from Subversive Cross Stitch and it was very easy to follow. I'm really happy with the way it turned out and I can't wait to cross stitch more horrible things! 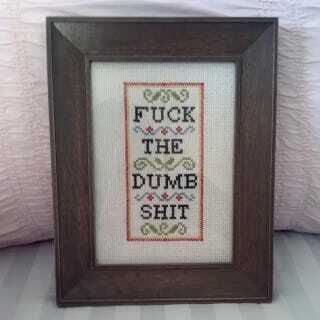 From now on all my family/ friends are getting cross stitched things for ALL the holidays!! Happy wedding day Jill Duggar & Derick Dillard! ETA: First pics!